The Sonoma County Bocce Club is organized to promote the sport of Bocce through education and amateur competition and for the enjoyment of both Players and Spectators. 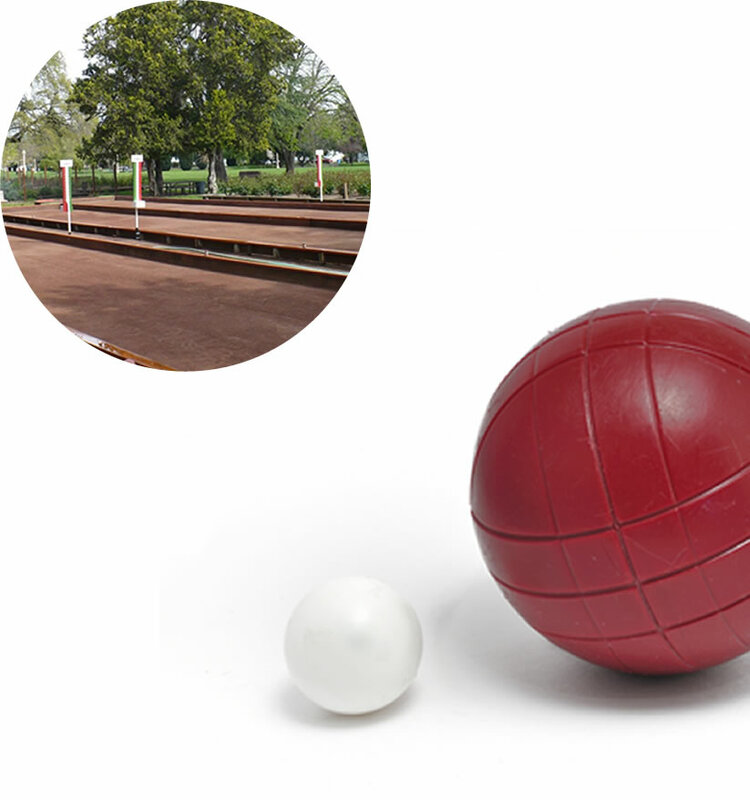 DEFINITIONS: Click here to view our Bocce glossary. THE GAME: The game of Bocce is played with eight (8) large bocce balls and one small ball called the ‘Pallino’. The object of the game is to roll the bocce ball closest to the ‘pallino’. There are four players making a team, and two balls per person. Two players from each team play at each end of the court. BALL RACK: For safety reasons, all balls must be placed in the ball racks between frames. BEGINNING THE MATCH: The Capos from both teams will flip a coin to start the match. The winner of the coin flip may choose to throw the pallino first or choose the color of the balls. Teams must play on assigned courts. A player may toss the pallino any distance so long as the pallino passes the centerline of the court and does not hit the back wall. If a player fails to validly toss the pallino after two (2) attempts, the opposing team will have one chance to put the pallino in play. If the opposing team fails to achieve a proper toss, the pallino will be placed on the centerline. In any case, when the pallino has been properly put into play, the team that originally tossed the pallino will throw the first bocce ball. PLAYING THE GAME: The team that originally tossed the pallino, whether successfully or not throws the first bocce ball. If a bocce ball hits the back wall, the ball is called dead and removed from the court and that team must roll again until a ball is left in play. After a ball has been left in play, the opposing team will roll until one of their balls is closest to the pallino or they have thrown all of their balls. The team whose bocce ball is closest to the pallino is called ‘Holding’ or ‘In’. This continues until both teams have used all of their bocce balls. The team, who scored last, throws the pallino to begin the next frame. A.) If a player rolls the wrong colored ball, simply replace it with the correct color when the ball comes to rest. B.) If a player rolls out of turn, return the thrown ball and replace any moved balls back to the approximate spot before the ball was thrown. C.) Each team member rolls 2 balls. If a player rolls more balls than is allowed in any one frame, that 3rd ball is dead and will be removed from the court, replacing all balls to prior positions. D.) If a ball is moved accidently before all 8 balls are played, the opposing team replaces the ball or balls to the approximate original position in a properly sportsmanlike manner. E.) When a team wins a game players exchange ends of the court and substitutions may be made. A team may make two substitutions per game, (one substitution from each end). Substitutions may be made between frames, if needed. The team winning the previous game will toss the pallino to start the next game. F.) Practice between games is not allowed. DEAD BALL RULES: Should any bocce ball make contact with the back wall, the bocce ball is considered a dead ball on impact and is removed from play until the end of the frame. If after a valid play only the pallino remains on the court, the team that last rolled must roll again until a ball remains in play or that team is out of balls. B.) If a bocce ball, after hitting the back wall, strikes a stationary bocce ball, that stationary bocce ball shall be replaced in its original position. The thrown ball is removed from play. C.) If a bocce ball hitting the back wall is not removed quickly enough and, as a result, strikes a moving bocce ball that likely would have hit the back wall, allowing the moving ball to remain in play, that moving ball remains in play where it comes to rest. PALLINO: Once the pallino has been put into play, it remains in play even if it hits the back wall. However, if the pallino is knocked out of the court, the frame will end, no points are awarded, and the game will resume from the opposite end of the court with the same team tossing the pallino. FOUL LINE: Player’s movements are limited to the foul line. The player may step on, but will not step over the foul line before releasing the pallino or balls. There will be a first time warning, the second time the ball will be declared dead and removed from the court and any affected balls will be replaced in the approximate positions. If the intent of the foot foul rule is abused, a Director of Sonoma County Bocce Club may remove the offending player from the game. ROLLING/SHOOTING: The ball must contact the playing surface before reaching the center line. Lofting and any form of Volo shooting IS NOT ALLOWED. The safety of players and spectators must be a concern. SCORING: Only one team scores in a frame. One point is given for each ball that is closer to the pallino than any ball of the opposing team. If during the game opposing balls are at equal distance from the pallino, the last team to throw will throw again. If at the end of any frame the closest ball of each team is equal distance from the pallino, the frame ends in a tie and no points are awarded to either team. The game will resume from the opposite end of the court with the same team tossing the pallino. Capos are responsible for designating a scorekeeper and for reporting the results of the match by submitting the signed Official Score Sheet to the designated location. MEASUREMENTS: All measurements will be made from the inside dimension of the bocce ball to the inside dimension of the pallino. Only scorekeepers and one representative from each of the opposing team may be present, on the court, during measurements. Both Capos must agree on which team has the point(s) if the scorekeepers cannot agree. If both teams have balls remaining, the team that does not have the closest ball to the pallino rolls again, if all balls have been played, points are awarded based on the balls that are actually closest to the pallino. FORFEITS: Game start time is 5:30 PM. If a team playing in a SCBC league forfeits six (6) games they will be dropped from league play and the team CAPO will be notified by mail. If a team is dropped from league play because of forfeits and wishes to play in future, they must return as a ‘new’ team the following year. PROTESTS: A protest will be considered valid only if the opposing Capo is notified at the time of the dispute (before the next frame begins) and the game is officially recognized as being played under protest. All protests must be submitted, in detail, in writing, to the Sonoma County Bocce Club Board within 72 hours of the disputed game. Their decision is final. A $10.00 fee must accompany all written protests. RESCHEDULING & RAINOUTS: Any game that is cancelled or halted due to weather or darkness should be rescheduled by agreement and noted on the score sheet by both team Capos. A rescheduled match will continue from the point at which it was stopped. The game must be made up within 4 weeks of the initial game night. PLAYERS: Additions to team rosters may be made until designated deadline. Completed rosters must contain names, addresses, phone numbers and (if possible) email addresses of all players. Official team rosters become final on their third week of play. After the third week with a roster player having played one game for that team, they are obligated to stay on that team. If a player chooses to quit, they cannot play for another team that season. A team may replace player vacancies during the season, except for the last 3 weeks of play. Any changes must be submitted by the team Capo, in writing, to the Sonoma County Bocce Club to be valid. A.) No more than twelve (12) people may be on a roster and no less than six (6). A PERSON CAN ONLY PLAY ON ONE LEAGUE TEAM. A team forfeits any game in which they play a non-roster player. The opposing team may not waive non-roster forfeits. One must play 30% of the scheduled league weeks of play to be eligible to play in any SCBC finals and championships. B.) If a team fields less than two (2) players, the game is considered a forfeit. Two players constitute a team. A 2 or 3 member team may play throwing only 2 balls per player. A 3rd or 4th player arriving late may enter the game after the completion of the current active frame. C.) There is no minimum age requirement but no more than ½ of the team may be under the age of 18 and at least one person in every game must be 18 or over. D.) A team may make two substitutions per game, (one substitution from each end). Substitution may only be made between frames. A player substituting out may not re-enter the same game. E.) No player may play two consecutive games from the same end of the court. A player who does not play the second game may reenter at either end of the court for the third game. F.) Players need not throw alternate throws. Consecutive or alternating throws by team mates shall be at the option of the players. G.) To preserve the integrity of the courts and in the interest of safety, all participating players must wear flat-soled shoes. No bare feet or open toed shoes will be allowed. A.) Team Capos are responsible for the actions of their players and fans (spectators). If there is any problem with a spectator that is not involved with any team, both Capos will suspend play and will attempt to resolve the problem in a timely fashion. B.) If a player is standing in the playing half of the court while the opposing team is rolling and the opposing team requests that the player step aside, that request will be honored. C.) Only participating players will be on the court while the game is in progress. Spectators are not allowed on the courts anytime during regulation play. D.) Unsportsmanlike conduct and vulgarity will not be tolerated by SCBC. If the conduct goes beyond the control of the captain, the opposing team has the option of stopping the game and claiming forfeit of the game and any remaining games and will note this on the score sheet. Any team member whose behavior is responsible for such action can be suspended or expelled from league play with approval of the Board of Directors. The Capos may enlist the aid of a Board Member, if present, to help resolve the situation. E.) The courts are not to be used as playgrounds. Bicycles, skateboards, scooters and/or non-bocce related activities are prohibited on or around the courts. All trash and litter is to be discarded in the appropriate containers. There is no smoking allowed. (Ordinance No. 3786) All animals must be on a leash at all times. (Ordinance No. 3796). All beverages must be in non-glass containers, per Park rules. F.) For any situations not covered here USBF rules will apply.